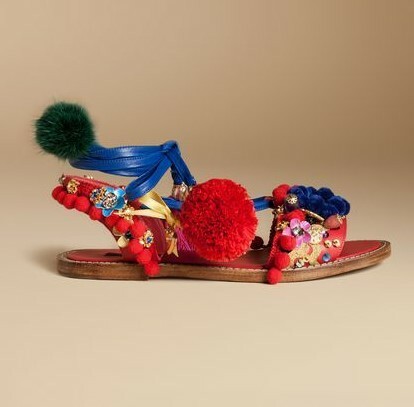 I love the festive look of the Dolce Gabbana pom pom sandal, but there's no way I'm buying a sandal originally named "Slave." I have no interest in supporting a company that consistently offends people with insensitive comments and product names. Plus there's no way I'm paying $2,395 for a sandal. 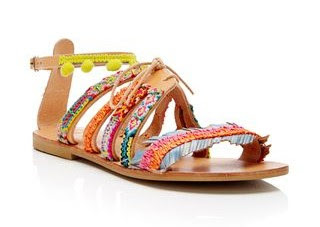 If you could point me in the direction of some sandals with a similar look and a smaller price tag, that would be great. It would be even better if they were handmade by an artisan somewhere. The Shoe Sleuth is on the case! I totally understand your sentiments, and I'm here to help. Though the sandals you mentioned above were said to be inspired by wheel carts in Sicily, it appears that sandals of that style are more frequently made in Greece. I've found a few options for you below, from items you can buy directly from the makers on Etsy to a few mass-produced options at lesser prices. I'll also keep an eye out for more, as I'm sure they'll start popping up everywhere. Stay tuned to the @ShoesNBoozeblog Instagram page for other options as we spot them. Maria BK's Etsy shop, Mabu by Maria BK offers a number of ornate handmade sandal styles, from bright colors with coins and beads to pastels with pom poms and tassels, all made in Athens, Greece. She even has flatforms and takes custom orders. The "Misty" gladiator sandals pictured here are available for $149.46, and other styles range from a little over $100 to just under $200. 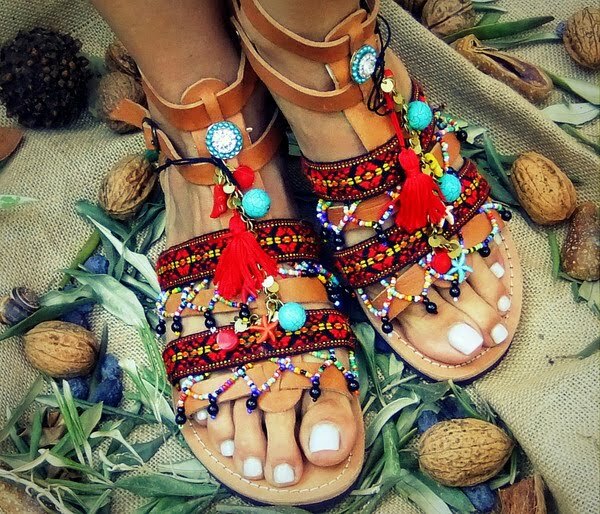 Based in Mykkonos, Greece, DelosArt offers not only fun, handmade sandals with bright pom poms and jewels at their Etsy shop, but also handmade flower crowns. 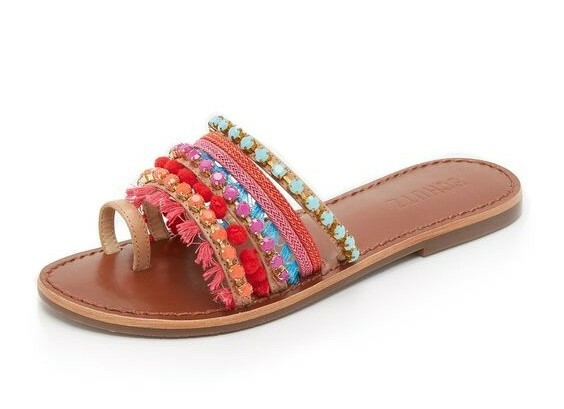 Prices on sandals range from $76.47 for metallic gold winged flats to $173 for beaded fringe gladiator sandals that lace up the leg, and the "Rainbow" sandals pictured are available for $132.08. Oh, and they also make sandals for children. A team of Greek designers, painters and highly skilled shoemakers, Innovative Greek Shoes prides itself on using traditional, centuries-old techniques and eco-friendly technology to create unique handmade sandals. This "Astarti 3" pair retails for $179.81, and prices for shoes range from to 77.15 for solid leather flats to $370.75 for leather and velvet wedges. Though Athenian designer, Elina Linardaki has her own Etsy shop, she has gotten so popular that she has attracted the attention of larger luxury retailers. The lace-up sandal pictured sells for $265 on Moda Operandi, while the fringe gladiator flat is a Muzungu Sisters exclusive and costs $188. If you like the ornate sandals but feel something a little more subdued is a better fit for your day-to-day life, consider the Estelen from Schutz. It still has the beads, tassels and pom poms, but everything's sized down a bit. It's available at Amazon.com for $160. R.C., do one of these choices fit your fancy? Other readers, what are your thoughts on the Dolce Gabbana controversy. Does it matter to you that they eventually renamed their "Slave" sandals after catching a ton of flack? Sound off in the comments. And if you have a case for the Shoe Sleuth, please feel free to send a message on the Shoes N Booze Facebook page or email shoesnboozeblog@gmail.com. Oooooh I'm soooo happy! Thank you, Shoe Sleuth! (doing happy dance) Yay! I guess, all things considered, it's better that they did rename it, rather than sticking to their thoughtless guns? But these choices are much cuter, anyway!